If you are planning to ride a horse, then there are few things that you will need to buy for your safety. It is not safe to ride a horse in your normal day to day dressing that’s why you will be needing a proper dress code for your safety. You often fall while horse riding, your legs get rubbed by the horse’s skin or saddle and you need proper boots to avoid sticking and slipping from the stirrup. In this blog post, I will cover the proper rider’s attire for horseback riding that will help you stay safe and look classy as well. Safety is the most important thing to be kept in mind when you think of riding such a huge animal. That is why first of all you will need to get a horse riding helmet. You can easily get that from a nearby riding attire store. If you couldn’t find a store nearby, you can ask your trainer where they have got the helmet. Don’t just do the formalities and try to wear any other type of helmet like helmets that are used in cycling, skiing etc. because other helmets will not be very safe for you and that is why you need to get a horse riding helmet only. Your helmet should not be very tight or loose and must fit your head properly. After all, you wouldn’t want to be uncomfortable while riding your horse, right? Another important thing in your horseback riding attire is riding boots. Your boots prevent slipping off of your feet from the stirrup. Your boots must have a little heel of about one inch. This heel helps to get more support and stability. There are different types of boots that are available in the market. These types include paddock boots and tall boots. Paddock boots are short boots that cover up to the ankle but the tall boots can cover your lower leg. The material of boots varies depending upon the price and comfort level. Rubber boots are less expensive than leather boots but if you can afford leather boots, these boots are worth the price you pay. My favorites are the Ariat English riding boots. Avoid boots with chains, more zips, extra decorative stuff etc. these things can stick to the stirrup. Don’t wear open shoes, toed shoes, slippers or snickers etc. these will not only hurt you but they will also increase your chances of falling off from the horse. Jodhpur pants and breeches are designed for horseback riding. These pants are designed to provide you enough flexibility and support. These pants allow you to move freely, they fit your body and are strong enough to help you avoid rub burns during horseback riding. If you are just starting with horseback riding, then I would suggest that you should wear any other pants that are a bit tight. You will be needing tight pants because of the rubbing involved in horseback riding. 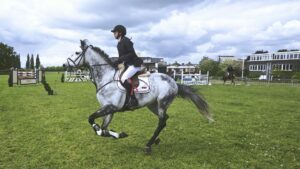 But, keep in mind that you should wear pants that are comfortable enough so that you can move your legs upward but not very loose that can stick to objects of the saddle. Getting stuck can be very dangerous. Go for jeggings with tall boots. Choose your shirt according to weather conditions. A good choice will be the one that is not so tight that you hardly breathe in it and also not very loose that hangs with your body. Your shirt should be comfortable and fit your body properly. If you wear jacket or coat, make sure it doesn’t have a lot of buttons or open zip. The best choice will be the one that has covered zip or buttons. Make sure your shirt is not long enough to get under your hip. Don’t wear dresses. Gloves are helpful for you for better grip on reins. Gloves are optional but if you are a beginner then you should consider wearing gloves as well. Normal gloves will not be helpful because they will make your hands more slippery and you will lose the reins. Specialty riding gloves are a better option for better grip. Check out our review of some of the best valued gloves online. Body protectors are mostly worn by the riders who are involved in horse jumping activities. If you are a beginner and you can manage to get these, I recommend you wear body protectors as well. When you wear these for the first time, you might feel that there is a little bit bulky and extra thing on your knees and elbows but these can be really helpful to protect your body from getting hurt when you fall off a horse. I have mentioned falling from the horse a lot but that does not mean you should not even try riding a horse. Falling is a normal thing for riders as the horse is a huge and unpredictable animal. So, instead of being scared, you should make a safety plan and go for this fun activity. It is important to take care of yourself while you go for horse riding. Riding a horse is not as simple as it sounds. There are many people who get themselves injured just because they do not take the proper safety measures before going for the horse riding. Proper dress code is one of the most important factors that help you stay safe while riding. There is a proper rider’s attire that I discussed in this blog post. It includes proper shirts, helmets, pants, boots, gloves and body protectors. These things help you to stay safe while horse riding. There is a misconception that horse riding is very easy. Watch this video to find out whether horse riding is easy or not! Please comment below if you have any questions or comments! I always dreamt of being an equestrienne and now I am ready for my first ride ever! I’m so jubilant that I came across this article that provides the proper dress code for my safety as I want to ride for as long as I can. Giddyap! Thanks so much for your comment Sariah. I’m so glad that you liked the post. 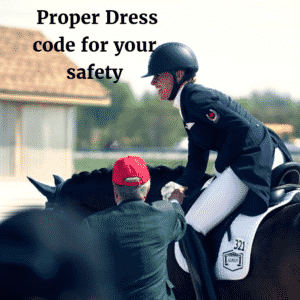 Thanks for sharing your article about the proper dress code for rider’s attire. I agree with what you said about the importance of safety when dealing with riding huge animals which is why it is necessary to have a horse riding helmet. My husband and I are planning to go on a vacation once our 1 month leave at work starts. 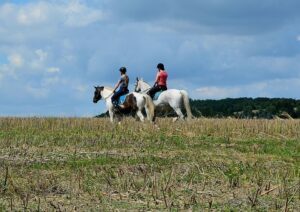 We’re interested in horseback riding which we haven’t tried even before. I’ll make sure to shop the things I don’t have yet for horse riding like the helmet.